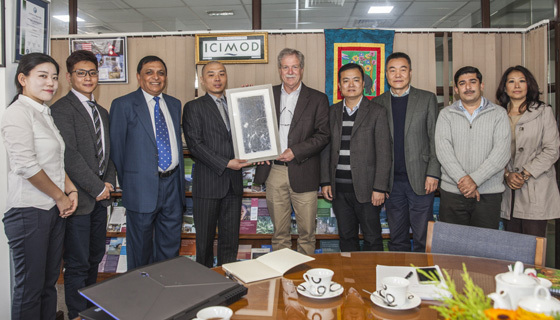 Xi’an delegates with ICIMOD team. An official delegation from Shaanxi Province, Xian, China visited ICIMOD from 19 - 23 February 2017, a visit organized by the Hindu Kush Karakoram Pamir Landscape Initiative. The Chinese delegation was led by Mr Li Tao, Coordinator, Commercial Press, Xi’an Centre, Department of Archaeology, North West University. Other members of the delegation included Mr. Li Yong, General Manager, Culture Events, Xi’an, and Ms. Yue Wei, Deputy Manager, October Cultural Relics Conservation Company Limited, Shaanxi. 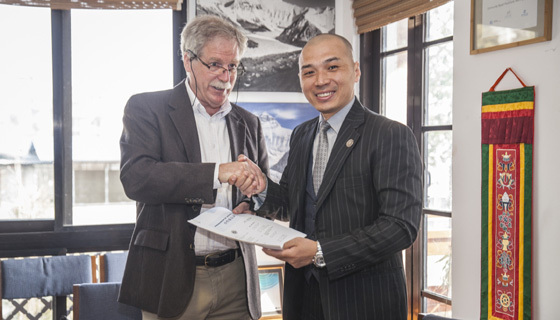 ICIMOD Director General Sign MoU with North West University. The delegation also visited Chinese Embassy to meet Mr. Zhang Bing, the 1st Secretary, Chief of Cultural Section, and Mr. Peng Wei, the Counsellor of the Economic and Commercial, to report on their collaborations with local partners and future plans for conducting cultural heritage conservation trainings in Nepal. The Embassy pledged its support to those activities. The delegation met Dr David Molden, ICIMOD’s Director General, and Dr Eklabya Sharma, Deputy Director General and introduced them the 3D high resolution digital imaging technology for digitization of cultural heritage relics and museums and their ongoing work in Hindu Kush Karakoram Pamir Landscape. The DG and DDG formally agree with the delegation for cooperation in future on the cultural activities planned for HKPL, after getting some experience the lesson learnt can be expended to other part of the HKH region. During this visit, ICIMOD tied their relationship with North West University by singing a Memorandum of Understanding (MoU). In addition the delegation also took advantage to have discussions with team of Hindu Kush Karakoram Pamir Landscape, Kailash Sacred Landscape, Strategic Partnership Unit and Himalayan University Consortium at ICIMOD.